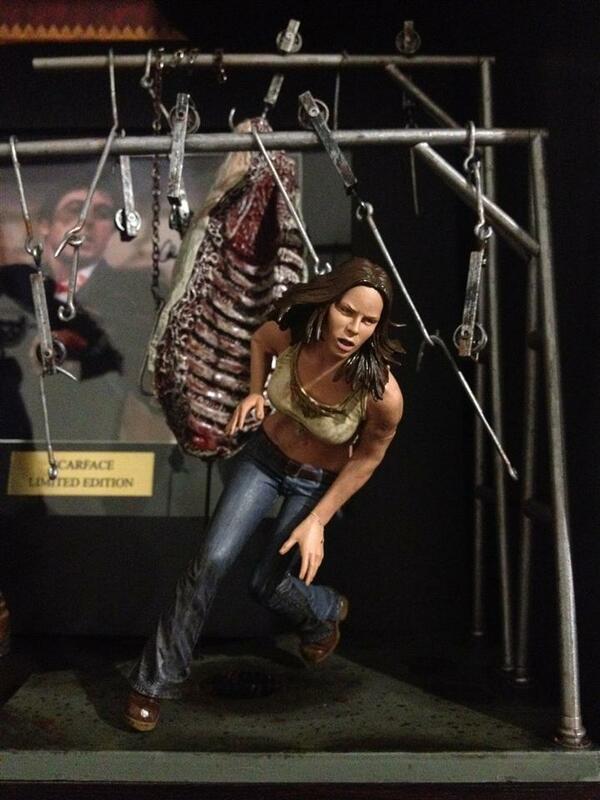 Mcfarlane Erin, The Texas Chainsaw Massacre collected in Figure Collection by Tayler Rowe - Collected It! Although the face of the figure looks not exactly like Jessica Biel, this figure is still pretty insane. the fast paced motion of her dodging chunks of meat and hooks gives off the perfect impression of being chased by none other than leather face himself. the only bad thing I discovered about this figure upon arrival was that the huge cow carcass in the background is NOT being held up by a meat hook, but instead supported by a thin black rod that joins to the base. I'ts no where near noticeable, but would have been much cooler if Mcfarlane had used the backdrop to its potential.